The Journal of the Royal College of Physicians of Edinburgh is the College’s quarterly, peer-reviewed journal, with an international circulation of 8,000. It has three main emphases – clinical medicine, education and medical history and humanities. 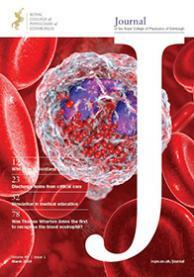 Here you will find the latest issue of the journal, plus the online archive. The JRCPE is currently included in the following Indexes – MEDLINE, Embase, Emerging Sources Citation Index (ESCI), Directory of Open Access Journals (DOAJ), Scopus and Google Scholar. Manuscripts should not be submitted simultaneously to another journal, should not have been accepted for publication elsewhere, and must not have been published already. Manuscripts are subject to peer-review, but the Editor reserves the right to make the final decision regarding publication and to make textual amendments where considered necessary. On acceptance, manuscripts are published in the in the earliest possible print issue of the JRCPE at the discretion of the Editor. All manuscripts are peer-reviewed. The JRCPE operates a single-blind peer-review system, where the reviewers are aware of the names and affiliations of the authors, but the reviewer reports provided to authors are anonymous, unless the reviewer is happy for their name to be put forward. To facilitate medical education through the publication and dissemination of quality original research papers. To publish a range of clinical, educational and historical material of cross-specialty interest to our international readership. To welcome submissions from a wide range of authors (not just Fellows and Members of the College), provided the paper has relevance to a general medical audience. Promote general medicine and enable physicians to keep up to date with developments in other specialties, particularly those which may impact upon their practice. All authors are required to declare relevant interest and this information is published in the JRCPE. All peer reviewers and Editors of the JRCPE are also required to declare relevant interests. This information is held centrally and can be made available on request. Authors can choose to assign copyright to the JRCPE or grant the JRCPE a non-exclusive licence to publish, if wishing to retain copyright. If copyright is transferred to us, we will indicate this in the copyright line that appears in the Journal. However, we grant back to you the right to use your own article (provided you acknowledge the published original in standard bibliographic citation form) in the ways detailed in the Licence, as long as you do not sell it or give it away in ways which would conflict directly with our commercial business interests. This is an open access journal which means that all content is freely available immediately upon publication without charge to the user or his/her institution. Users are allowed to read, download, copy, distribute, print, search, or link to the full texts of the articles, or use them for any other lawful purpose, without asking prior permission from the publisher or the author. Users can use, reuse and build upon the material published in the journal but only for non-commercial purposes and with appropriate credit given. The Editors of the JRCPE view alleged, or suspected, medical or biomedical research misconduct as a serious offence and will not hesitate to refer suspected cases of misconduct to the appropriate bodies. The JRCPE is currently included in the following Indexes – MEDLINE, Embase, Emerging Sources Citation Index (ESCI) and Google Scholar. There are no submission charges or article processing charges (APCs) for submissions to the journal.